Nuby Printed Wonder Sip Cup with Handle - 240 ml | Red | Non-Spill. Ensure your baby feels comfortable transitioning from a feeding bottle to consuming food on his own with this cup. 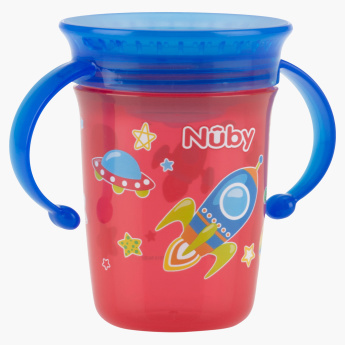 The soft rim is gentle on the child's mouth and the handles help your child hold the cup firmly.